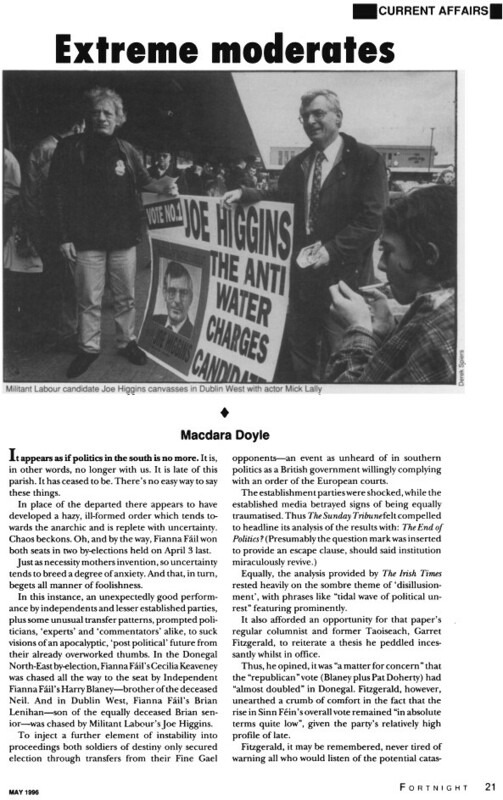 A clipping from Fortnight Magazine which shows the Late Mick Lally canvassing for Joe Higgins in the 1996 Dublin West by-election. Joe Higgins was running for Militant Labour (which later became the Socialist Party). The article (which I only have this page of) is about the shockwaves caused by the Vote gained by Higgins in the by-election. I’ve some Joe Higgins Leaflets from that Campaign posted in the Militant Labour Category. Like many my main memories of Mick Lally were from Bracken and Glenroe… and today as I heard reports on the funeral service on the news it also brought memories of Glenroe back. It was an institution and there were many houses across the land when Sunday at 8.30 everything stopped and families sat down together to watch. In the Granny and Grandads on the regular Sunday visit and later as roles were reversed they with us. People who thought it rude to watch Television when you had guests (or were a guest) made an exception for Glenroe. In time as people Passed on or Emigrated they were missed at the Sunday night ritual. What would Granny have thought of Miley and Fidelma, we wondered? For it was Miley and the Galway Hurlers that you could never say a bad word about. Later on in the shows last years, it was us who went up on the Sunday for Dinner and then set off home after Glenroe. One night the Gardai called to the house (a few weeks after a murder in the locality) asking if we could remember seeing a strange car in the area at around eight in the evening on a Sunday.If you have ever been questioned about your whereabouts at a certain time and date you feel foolish not being able to remember. Eventually I figured that we’d left after Glenroe so we wouldn’t have been in the area at the time. In the mid 80s I worked as a bus conductor on the 84 route that went to Kilcoole, where some of Glenroe was filmed. On a daily basis we’d carry the day trippers to Kilcoole, out to see if they could get a glimpse of Biddy and Miley.